"I watched a video on Facebook of the Perfect Biotic and it made sense of why I felt so lousy. I ordered it and tried it. It was life changing..."
As the world’s best selling brand of probiotic, Probiotics America sets the standard for digestive supplements. Our team of experts are devoted to delivering the most pure, potent, and effective probiotics, anywhere. All our formulas are scientifically tested and proven to support both digestive and immune health. I am a single young man who works full time and just started college. My mother started to grow concern a few years back when she noticed how sluggish and tired I was for being so young, but yet ate a healthy diet for someone my age. After many hours of researching the endless sources on what one may think causes this sleepy effect, she was taken in by what scientifically made sense. After reading about what probiotics can do for the human body not only intrigued her, she also learned that you must do your research to gain the knowledge needed to make sure you are purchasing a high quality product and Probiotic America was the only one that passed her expectation. After using the product for almost three months I have noticed my energy levels have accelerated. Here at Probiotic America, we’re driven to create the most potent and effective probiotics possible. And while there are many different brands of probiotic available, they’re not all created to our same high standards. The truth is, many brands use probiotic formulas filled with weak or even dead and inert strains, making them ineffective for improving digestive health. Lower-quality probiotics also contain fewer “CFU’s” or Colony Forming Units, which are the main indicator of effectiveness. 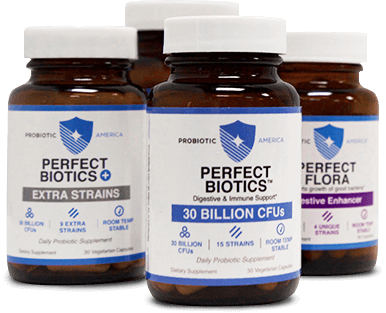 At Probiotic America, we’ve made sure every capsule of our breakthrough Perfect Biotics formula contains an incredible 30 billion CFU’s of potent, viable probiotic strains. There’s only one sure way to know if your probiotics are effective. It’s called the “Milk Test” and it measures the ability of a probiotic to produce enzymes in a glass of milk. If a formula can’t produce enzymes when added to milk, it probably won't be able to produce enzymes in your stomach. The Milk Test is easy to do: Simply pour 4 oz. of cold milk into a glass, then and add two capsules of probiotic to the milk. After you’ve added the capsules, leave the glass at room temperature for 48 hours. After 48 hours, check the milk– If it has thickened into a yogurt-like consistency, it means your probiotic is working normally. And if not, then it’s time to seek out a new supplement!